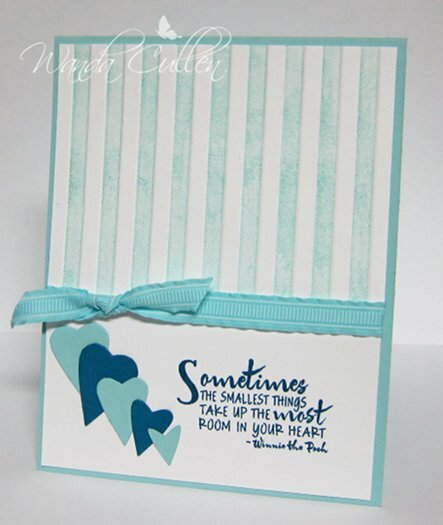 This is a quick card and post for the Color Challenge on SCS where Julia has thrown out white, Pool Party and Island Indigo for us to use. We are also challenged to use a sentiment as our main image. I went with a CAS design and brayered the one side of SU's Stripes EF with Pool Party ink. The teeny heart dies are by Verve, as is the Plain Jane sentiment. Hope you're having a great day! The sun is out and it's to be another mild day in VA - woohoo! Good Monday morning! 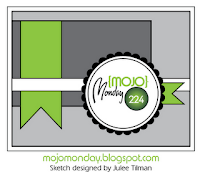 The sun is out and I'm feeling the mojo with Julee's great Mojo Monday sketch challenge - a circle or square! I chose to make a 4 1/4" square and had this paper already on my desk from my last project, so went with the scraps to create this card. Very straight forward, so I'll proceed with my recipe list. ACCESSORIES: Victoria EF, Black satin ribbon, Mini rolled roses Die-Namics, Leafy sprigs die by Verve. Welcome trouble: it's the only way you'll find put who your true friends are. I can't believe it's the last Saturday in January already, which means my two months as a guest designer with the challenge team at ODBD is over (sniff, sniff)! I've been so blessed by getting to chat with these uber talented and fine Christian ladies! I consider them friends and hope to keep in touch with them via blog land and future challenges! Thanks again, Chris, Kelley and the team for inviting me! So, enough of the chit chat and on to my card and some challenge details! To make the challenge even more fun, we will be giving out a prize, a $15 gift certificate to be used toward stamps at the Our Daily Bread Designs store!! Entries for the prize must be submitted by Friday, February 3rd at 8 a.m. EST. One random winner will be chosen and announced next Saturday. If you are not using ODBD stamps, please do not enter more than once. Additional entries without using ODBD stamps will not be commented on or will they qualify for prizes. While it is not required to use Our Daily Bread Designs images and sentiments on your creations, we would love to see them if you have them.As a way of recognizing those who do use Our Daily Bread Designs stamps, we will again be choosing 1 to 2 creations to spotlight for our Shining the Light Award.Inorder to qualify for this award, however, you must use Our Daily Bread stamps and have yoursubmission added to Mr. Linky by Friday, February 3rd at 8 a.m. EST. 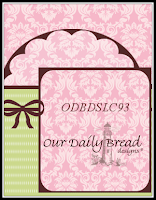 If you upload your creations to Splitcoast Stampers or any other online gallery, please use the keyword is ODBDSLC94. When creating your posts on blogs please include a link to the challenge. 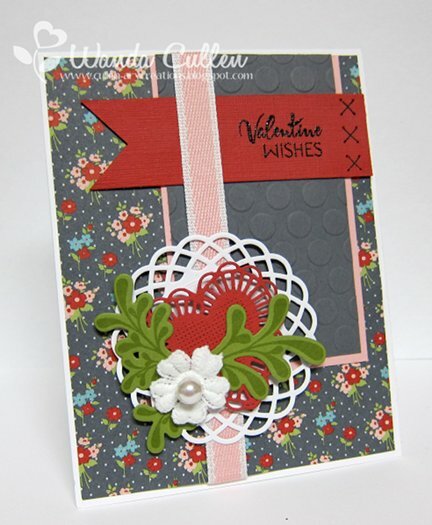 I didn't use actual lace, but did choose a lacy heart die and the embossed BG also gives a lacy feel to the card. My card is also for the Viva la Verve Challenge on SCS where Teresa Kline has created a fabulous sketch layout! It also qualifies for the Technique Lover's Challenge on SCS where Judy has introduced a fabulous faux porcelain technique that I will definitely be using over and over again! I brayered Blushing Bride ink over my EF...a 5x7 Cuttlebug folder entitled "Kassie's Brocade". You'll want to click on the link to get more details for this look! I used a square Nestie to emboss the white panel...a small yet elegant detail that I love! 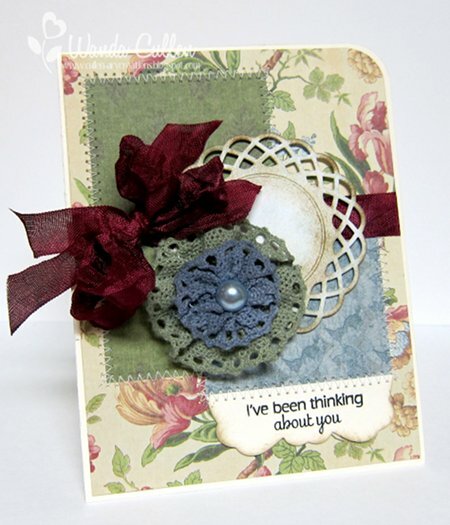 The sentiment is from ODBD's Special Blend set - perfect to convey your love to a friend! The heart is the largest of 2 dies in a set by Cheery Lynn Designs - "Pair of Hearts". ODBD now carries some of the more popular Cheery Lynn Designs, so check it out HERE and do some shopping! There are more fabulous samples to inspire you, so be sure and visit these ladies and leave them some love! 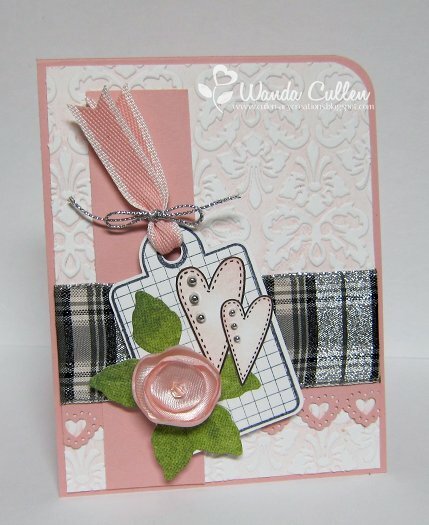 ACCESSORIES: Square Nestie, Plaid EF, Kassie's Brocade EF, Two of Hearts dies by Cheery Lynn Designs, Foliage dies by Spellbinders, Prima by Blue Moon Beads (found at Michael's), Brayer, Blushing Bride ribbon. Good Friday to all! Raise the Bar is having a recipe challenge this week: pink, silver, ribbon and tag! 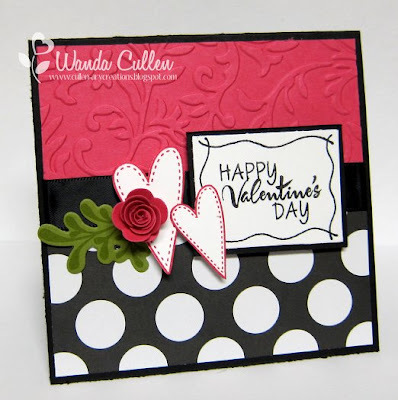 So fun and just perfect for a Valentine creation! I also played along with the Viva la Verve challenge on SCS using the week 2 sketch by Andrea. I tweaked it a bit here and there but the overall feel to the sketch is there. My BG is a new technique that Judy introduced on Monday in the Technique Lover's Challenge on SCS....LOVE this look! It's a way to mimic some pottery/porcelain pieces she saw when she visited Belleek Pottery in Ireland. I brayered Blushing Bride ink over one side of an EF (Cuttlebug's Kassie's Brocade - love the 5x7" size! ), then inserted white CS and ran it through my Big Shot! The flower is a new discovery at Michael's...love it! Be sure to stop by and see what the other bartenders have created! We hope you can join us! ACCESSORIES: Kassie's Brocade EF, Corner chomper, Blushing Bride ribbon by SU, Silver wire cording, Tagged rectangle die by Verve, Kaiser silver pearls, Foliage die by Spellbinders, Offray ribbon (Walmart), Lace heart border die by MS, Prima by Blue Moon Beads (Michael's). The Ways to Use It Challenge on SCS is asking us to look back at all 2011 WT challenges and combine as many as we can on a card. I used 7 challenges: WT357-Stuck on Me (rhinestone sticker), WT354-Digi Day, WT346-Leaves, WT344-Pink, Pink, Pink, WT319-Oval-icious, WT318 Hey PEOPLE, WT316-FLOWER Power. My sweet little digi image is from By Lori Designs and was colored with Copics. 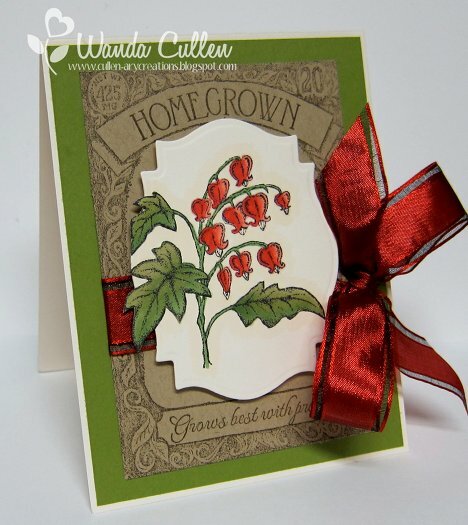 This card is also being entered into Jen's Sketch for You to Try challenge for January. Optimism: A cheerful frame of mind that enables a tea kettle to sing though it's in hot water up to its nose. So today finds me singing in the clouds and rain...how about you? Hi everyone! 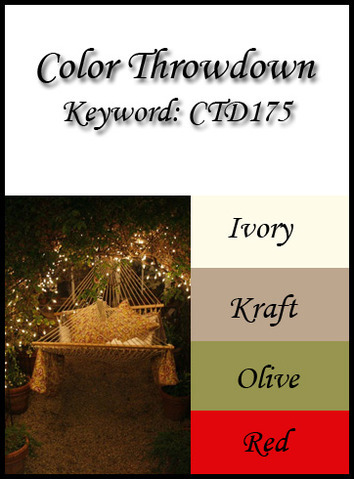 It's time for another Color Throwdown Challenge...presented this week by the talented Joan! My card was ridiculously simple because the DP did all the work! 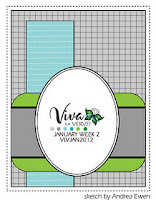 I thought this pattern from the Beach Cottage pad by Creative Imaginations was perfect for these colors! A quick Verve sentiment from the Sweet Treats set, a bit of May Arts jute twine and a little Maya Road tag finished it off. The border is a Martha Stewart punch called Vintage Floral. 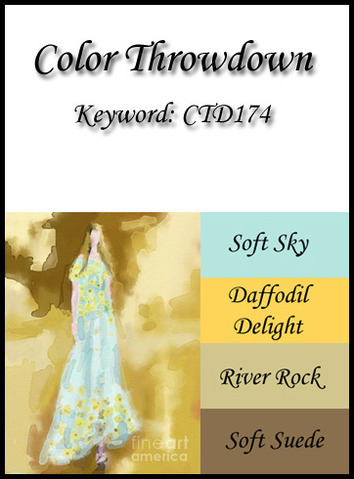 Remember, you do not have to have the exact colors to play the Color Throwdown challenge. If you don't, just use the closest you have. 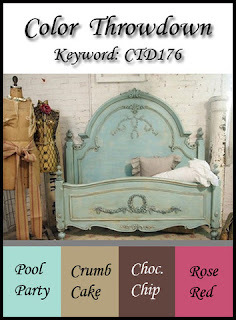 So, hop on over to the Color Throwdown blog and play along with us this week. Please use the link service to post your card and please link directly to your card so we can find it easily. And please include a link in your post to the Color Throwdown. If you upload your card to a public forum, please use the keyword CTD176 so we can see your beauty all in one place. Hope to see you there! Be sure to check out what the other team members have come up with this week. As with the last card, I cut the daisies apart so I could arrange them around the sentiment which is from ODBD Little Things set. I sponged the sentiment with Basic Gray ink while it was still in the Nestie and added some Diamond Stickles to the flower centers. I'm loving this new Twitterpated DP (isn't that such a cool word?) by SU. It's in their new Occasions Mini catalog and though I have paper and more paper, I just couldn't resist these lovely patterns! I tell ya...I have a sickness - lol! To make the challenge even more fun, we will be giving out a prize, a $15 gift certificate to be used toward stamps at the Our Daily Bread Designs store!! Entries for the prize must be submitted by Friday, January 27th at 8 a.m. EST. One random winner will be chosen and announced next Saturday. If you are not using ODBD stamps, please do not enter more than once. Additional entries without using ODBD stamps will not be commented on or will they qualify for prizes. 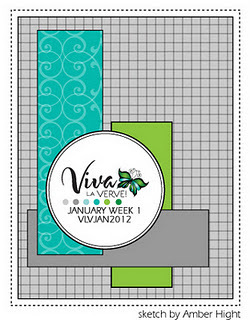 While it is not required to use Our Daily Bread Designs images and sentiments on your creations, we would love to see them if you have them.As a way of recognizing those who do use Our Daily Bread Designs stamps, we will again be choosing 1 to 2 creations to spotlight for our Shining the Light Award.In order to qualify for this award, however, you must use Our Daily Bread stamps and have your submission added to Mr. Linky by Friday, January 27th at 8 a.m. EST. 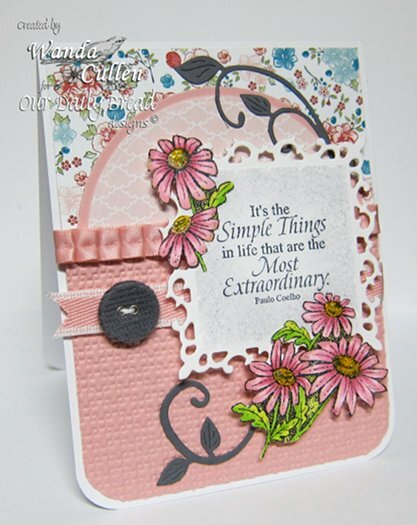 If you upload your creations to Splitcoaststampers or any other online gallery, please use the keyword is ODBDSLC93. When creating your posts on blogs please include a link to the challenge. You'll want to stop by and visit the other Challenge Team designers who will WOW you with their fabulous creations! Angella Crockett - DT member who graciously joined us this week! Chris - our CT leader is sitting it out this week...taking a well-deserved break! 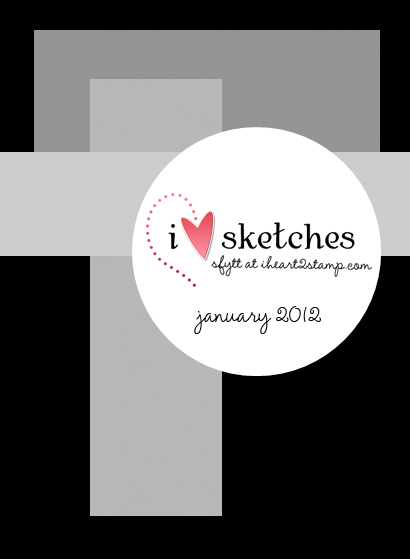 Thanks for stopping and commenting...hope to see you join us with this fun sketch challenge! Good Friday everyone! It's time for another Raise the Bar challenge and we're still "ringing in the new year" by offering a challenge to use circles. My card didn't have as many circles as I originally planned but thought it would still pass for the challenge call! 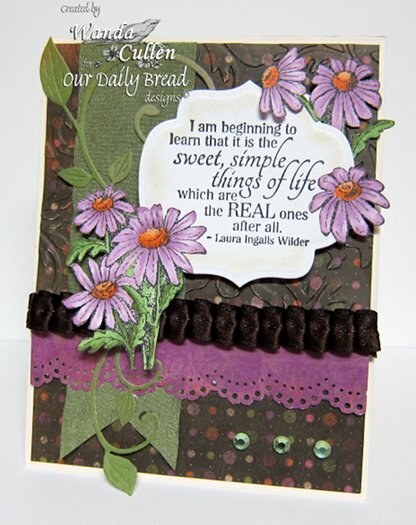 :-) The embossed polka dots, the circular doily tag, and circular flower clusters in the DP are my "circle elements". I used Julee's sketch (in the flipped version) for the Mojo Monday Sketch Challenge...love it! The heart is a new die by Cheery Lynn Designs...the smaller of the pair of hearts in the package. I added some faux stitching on the sentiment banner by piercing holes then connecting with a fine ink pen. If you're posting to SCS, please use the keyword RTB88 so we can see all the creations in one place. For more inspiration, you'll want to check out the other bar tenders' creations! ACCESSORIES: MS doily tag, Pair of Hearts die by Cheery Lynn Designs, Leafy sprigs die by Verve, Prima w/pearl (? source), Large dotted EF, Blushing Bride ribbon by SU, Black EP. Hi, everyone! It's time for another Color Throwdown Challenge and Danielle has given us a lovely romantic hammock photo to give us our color palette and also theme inspiration if we choose. Hearts and flowers are typically linked with romance, so I chose this new bleeding hearts image from ODBD to layer on the seed packet BG. I re-purposed this yummy ribbon that was given to me on a package from a friend...going to have to find out where she got this ribbon as I totally LOVE it! I colored with Copics (R21, R24, YG91, YG93, YG63, E0000). Remember, you do not have to have the exact colors to play the Color Throwdown challenge. If you don't, just use the closest you have. So, hop on over to the Color Throwdown blog and play along with us this week. Please use the link service to post your card and please link directly to your card so we can find it easily. And please include a link in your post to the Color Throwdown. If you upload your card to a public forum, please use the keyword CTD175 so we can see your beauty all in one place. Hope to see you there! Be sure to check out what the other team members have come up with this week. ACCESSORIES: Labels Eighteen Nesties, Ribbon, Copics. Chris has a fun word play challenge for this week's ODBD Shining the Light Challenge! Use three tools or embellishments beginning with three of the letters in the work W-I-N-T-E-R. For my card I chose to use N-Nestabilities, E-Embossing folder and R-Ribbon. My sentiment is from ODBD Simple Things set and then I cut apart the daisy image (after coloring with Copics) from the set called Daisy. I love that this floral image can be so versatile...you can leave it as is or you can do your own "floral arranging"! I used one of Karen Giron's Sweet Sunday sketches for the layout. 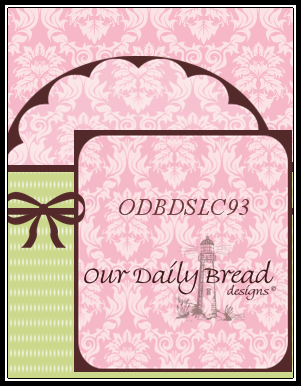 To make the ODBD challenge even more fun, we will be giving out a prize, a $15 gift certificate to be used toward stamps at the Our Daily Bread Designs store!! Entries for the prize must be submitted by Friday, January 20 at 8 a.m. EST. One random winner will be chosen and announced next Saturday. If you are not using ODBD stamps, please do not enter more than once. Additional entries without using ODBD stamps will not be commented on or will they qualify for prizes. online gallery, please use the keyword is ODBDSLC92. When creating your posts on blogs please include a link to the challenge. To see all the creations in one place or join the challenge, click here. We hope you can join the challenge! We look forward to seeing your creations!! Thanks for stopping by and for taking time to comment! ACCESSORIES: Labels Nine Nestie, Fanciful Flourish die by Cheery Lynn Designs, Pleated ribbon, Doily lace border punch by MS , Ribbon, Rhinestones, Victoria EF. Raise the Bar is BAAACKK!! And..we are so happy to have By Lori Designs as our sponsor this week! I had so much fun coloring this new digi called Lollipop Saylor! Isn't she just the cutest? We are also asking that you include some kind of banner element on your card, so I used some Die-Namics to create this star-studded banner. I sponged So Saffron ink around the image while the CS was still in the Labels Twenty One Nestie. I colored with Copics and added some sparkle to the star on her jumper using a Sakura Clear Star gelly roll pen. 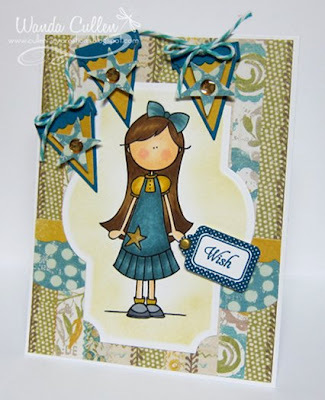 ACCESSORIES: Small star punch by SU, Banner Die-Namics (MFT), Baker's twine, Dimensional stickers, Tiny tags die by PTI, Brad, Labels Twenty One Nestie, Large scallop Die-Namic (MFT). It's Wednesday and with that comes another Color Throwdown Challenge! This week, Broni has some fabulous colors for us along with a terrific watercolor picture to inspire us! Here's the card I created...perfect for inking up some new Our Daily Bread Designs stamps that have a grunge look to them! 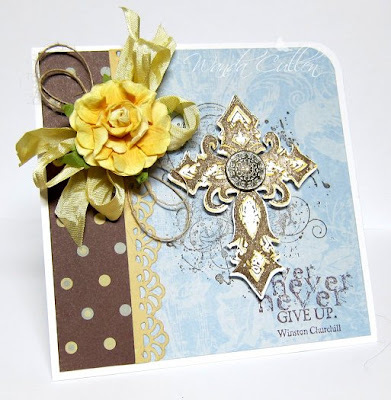 I stamped the separate cross image in Soft Suede ink, then added highlights using a Gold Spica pen and a Sakura Gelly Roll "Clear Star" pen and popped it up with foam dots. The fancy vintage brad is by SU. As always, if you don't have the exact colors just use the closest you have and be sure to direct link your card to the linky tool at the bottom of the CTD post. Also, please link the Color Throwdown in your blog post. 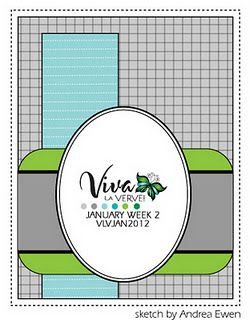 Stacy Morgan - Twinshappy - January Guest Designer! ACCESSORIES: Corner chomper, Vintage brad by SU, Prima, MS seam binding, Twine, Doily lace border Die-Namic by MFT, Spica & gelly roll pens. It's a cloudy, snow-in-the-forecast kind of day but it's also Mojo Monday time and there's a great new sketch to play with...so...let it snow! I also made this for the Technique Lover's Challenge on SCS where Judy has asked us to look at the techniques for 2011 and choose one to re-do. I love stitching details on cards and went with TLC304 to add Sewing/Stitching...Faux or Real. I needed to distress the Martha Stewart doily tag and started with some Antique Linen ink. Ehh...not enough...needed a hint of blue so added a tad of Baja Breeze ink. Still not grungy enough, so I added a bit of Soft Suede. 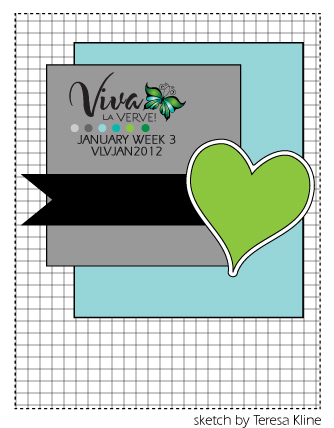 I used Verve's Lovely Marquee die and cut off an edge to add a border for the sentiment. I hand dyed the seam binding using Tattered Angels Pomegranate Shimmer Mist and topped off the card with a lacy Prima flower. Thanks for stopping by...hope your week is starting off on a positive note! Happy Saturday everyone! Today I am popping in to share the first challenge of the New Year at the Our Daily Bread Designs Shining the Light challenge!! "In with the new....out with the Old"
The team challenges you to create a card using something new and something old on your card. To make the challenge even more fun, we will be giving out a prize, a $15 gift certificate to be used toward stamps at the Our Daily Bread Designs store!! Entries for the prize must be submitted by F riday, January 13th at 8 a.m. EST. One random winner will be chosen and announced next Saturday. If you are not using ODBD stamps, please do not enter more than once. Additional entries without using ODBD stamps will not be commented on or will they qualify for prizes. While it is not required to use Our Daily Bread Designs images and sentiments on your creations, we would love to see them if you have them.As a way of recognizing those who do use Our Daily Bread Designs stamps, we will again be choosing 1 to 2 creations to spotlight for our Shining the Light Award.Inorder to qualify for this award, however, you must use Our Daily Bread stamps and have yoursubmission added to Mr. Linky by Friday, January 13th at 8 a.m. EST. 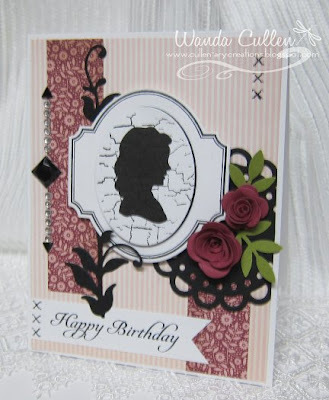 If you upload your creations to Splitcoaststampers or any other online gallery, please use the keyword is ODBDSLC91. When creating your posts on blogs please include a link to the challenge. I couldn't stop with just one card...had to use some new stamps along with some new papers by Echo Park for my first card. I was so excited to see the bleeding heart image in the January release as it was one of my favorite flowers in my mom's flower garden! I colored with Copics using R81, R83, & R85 for the flowers & G40, G21, & G24 for the leaves; C00 was used along the frame edge. I fussy cut the flowers and mounted them on the hand cut doily frame from the new Special Blend set. My "old" element is the top note die. My new element is this Fun Day 6x6 designer paper pad by My Mind's Eye with its unusual color palette of kraft, cream and black. I still consider the clover image and sentiment from the Simple Things set to be new since it just came out in ODBD's December release. My "old" element is the button which I found in my button tin... probably from my grandmother's stash and added to by my mother. The jury is still out on this monochromatic card...sure do miss my colors - lol! ACCESSORIES: Top note die by SU, Large dot EF, Black satin ribbon by SU, Vintage button by PTI, Copics, Adhesive pearls by Prima Marketing, Dainty lace border Die-Namic by MFT. 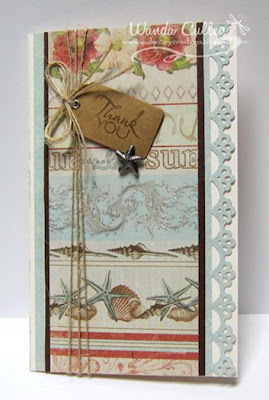 PAPER: Fun Day DP (MME), Black, Vintage Cream. ACCESSORIES: Oval Nesties, Clover die by ODBD, Seam binding by SU, Button, Twine, Black lace trim. Viva la Verve is Back! OK...this is where I start growling and where you start imagining the dotted swiss panel was run through the Big Shot with the dotted swiss EF. It's lying here on my desk, so is that close enough? I had already glued the flower and leaves down when I remembered I forgot the embossing step and I simply did not tear it apart to redo it! I'm hoping the challenge police won't throw me out! ACCESSORIES: Rhinestones by Prima Marketing, Fern punch by MS, Foliage die by Spellbinders. Ways to Use It - create a birthday card for Michelle who is hosting today and include some fave elements. I've had this MFT set since Thanksgiving and am just now inking it up. 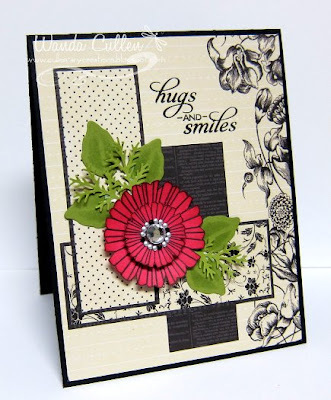 The mini rolled roses and the floral flourish are 2 of my fave dies from MFT. I added some faux cross-stitching by paper piercing, then used a fine ink pen to draw in the cross stitches. Hope you are having a great week...I'm so grateful the temperatures here in VA are moving out of the 20's and 30's for a few days...feels like a heat wave compared to 7 degrees with wind chill factor! ACCESSORIES: Mini rolled roses Die-Namics by MFT, Floral Flourish Die-Namics by MFT, Rhinestones by Recollections, Frond punch by MS, Doily Die-Namics by MFT, Piercing tool & template.